The Boy Scouts of America National Council, meeting May 23 in Grapevine, Texas, voted to open the BSA to gay scouts but not gay scout leaders. The policy change takes effect Jan. 1. George Takei posted this image on his Facebook page. “While I am heartened by the decision of the Boy Scouts to lift the ban on gay scout members, the ban on LGBT scout leaders remains in place. 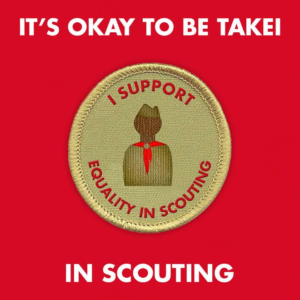 This means that when a scout turns 18, the rule suddenly prevents him from serving the very same organization he was just a part of,” Takei said. “The rule prevents people like me, who were scouts in our youth, from participating based on who we ARE and who we LOVE. This is simply un-American. Claims about member ‘safety’ in the presence of LGBT scout leaders are both offensive and illogical; the ban applies equally to lesbian troop leaders as it does gay ones, indicating that it is based on fear and animus.